I remember seeing mini trolleys for children inside a supermarket. But the racks are full sized. With regards to the above, there are certain person or persons unknown do not know how to properly use the gent's at the above location. The gent's at that location broke down in record time after being repaired. Remark : A chinese boy in primary school uniform (white & blue shorts) was playing with his younger sister the 'pushing game' with trolley in the center. If small kids playing with trolley in shopping mall is something that annoyed you.. and you fell compel to report in a forum, then how to have a nice day ?? ungkb is the MOST consistent forumer i come across. Who has the seminar to post what we posted for many many years?......if he had 磨铁棒, he would have lots of needles by now. amazing - what some people can do!!! maybe he can conduct and earn lotsa money & followers in his seminars on ' amazing stamina'? Thanks for the correction - is Stamina, not seminar .... and tupai has an amazing idea! Small kids are so fun to be around with, so innocent & so playful. Not when they start running around, knocking your brittle or precious stuff in your living area, stamping and dancing on your leather sofa while their parents don't even flinch or batter an eyelid! Like it or not, hyperactive kids are BANNED from my home!..can't risk them to break anything!...ITS MY BARANG!...not theirs! Couple of my relatives with small kids know my attitude...they eagle eye their kid, or next time NO COME! My place is for CIVILIZED ADULTS ONLY!...others can do whatever, behave or make a mess IN THEIR OWN PLACE..not mine. 5,6 year old kids are so innocent, don’t ban them “teach” them. If the parents intervene, “teach” them as well. I know it’s not your responsibility, but do the kids a favor, help them while their parents can’t. For older kids – kick them out! the parents too. BOTH..if applicable..people may have to learn things the hard way...quite usual trend observed...Its the parents I'd like to teach a lesson, not really the kid, but then again, hyperactivity is subjective..its THE parents who have or MUST do something when visiting people's home. I won't just accept "Sorry! hope it doesn't happen again" YES!...IT WON'T...after my lesson of "GET OUT!... OUF! OUT! There are places YOU DO NOT BRING Babies and toddlers...couple of them is SUPERMARKET or WET MARKET! MY view! BTW..why do you think you see school kids not wearing helmets and since when they got licence to ride dad's motorcycle around some streets? Its comes from lackadaisical and flawed upbringing. Can't say DON'T KNOW!.. BTW...few days ago...kid nearly knocked off my precious RM1k LP stylus..just by a few inches...you think parents gonna pay for a replacement?..I think not. 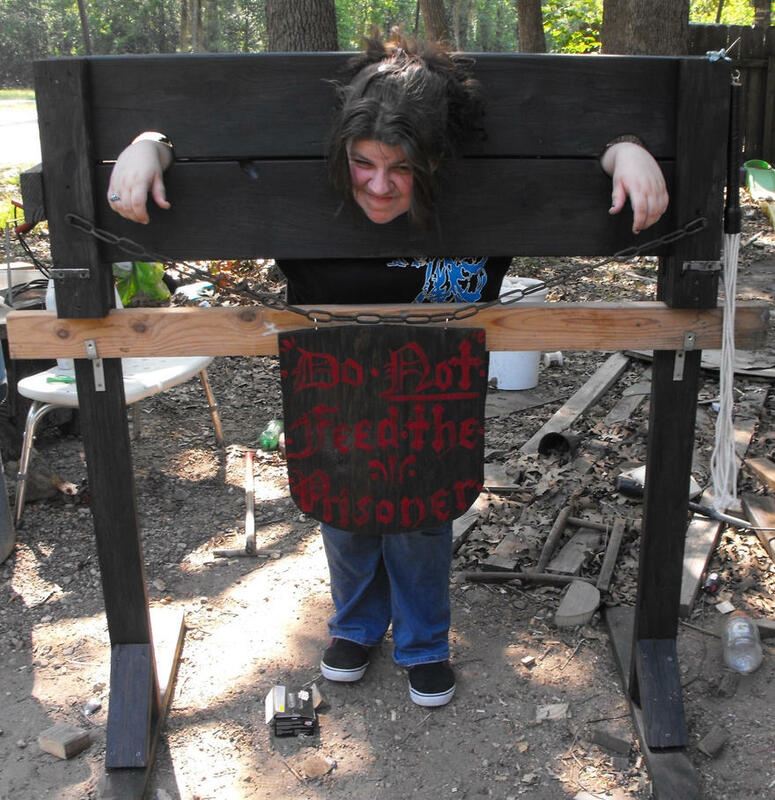 Call me cruel or not...maybe I should build a medieval hand and feet stocks and display it prominently...threaten some HA kid with that if he/she start flying around. My sister-in-law has kids who are hyper active. When they come a visiting, the kids will be running and jumping on my sofa. The youngest boy likes to use the sofa as a ladder to jump and hang onto the staircase railing. Parents boh chap seow type. Once I lost my cool and smacked the kid. That cauzed a ruckus. The kid's parents and my wife ganged up on me. "Why you smack someone else's kid?" After that they didn't visit us for some time. No loss for me but my missus. ....BTW...few days ago...kid nearly knocked off my precious RM1k LP stylus..just by a few inches...you think parents gonna pay for a replacement?..I think not. Of course, bslee, it is your house and you are the master of your house. I have an entirely different approach than you. I don't look at the material damages and monetary losses as something which is paramount that will dictate my course of action.. I treasure the moment when kids are in my house. Granted, they should not have absolute freedom to break things and mess the house as they like, but I would prefer they enjoy being a guess in my house more than anything else.. I treasure the memory more than the material value. Maybe I don't have really expensive items or collections that are irreplaceable once broken. But then again, so what if items are broken, I don't bring those things to another world and may not be able to enjoy those things indefinitely. The memory of a joyful moment with the kids are something much more important to me, and I believe it matters to the kids too. Having said that, it does not mean kids can do anything they like in my house. I once scolded one of my nieces because she and others sprayed almost one third of my Hugo Boss cologne at the edges of the cooker hob as insecticide to kill the ants !! I was mad because of the safety risk as cologne contains flammable alcohol and it is extremely dangerous to spray near a cooker hob. Life is short, don't get to work out by material gain or loss.